Research says kitties are good for you. When you think of "crazy cat ladies", the eccentric Big Edie and Little Edie of Grey Gardens fame come to mind. But thanks to feline-loving celebs like Taylor Swift and Katy Perry, owning a cat has suddenly become cool. For a long time, though, popular thought was that so-called “cat ladies” were crazy. Besides medieval hysteria about witches and their trusty black sidekicks, some of this fear may have stemmed from the notion that toxoplasmosis — an infection caused by a parasite found in cat feces (along with undercooked meat and contaminated water) could cause people to lose their minds. People like cat ladies. But a recent study published in the journal Psychological Medicine found no link between cat ownership and any sort of psychosis later in life. In fact, it turns out that the cats in our lives are doing the opposite of making us crazy. They actually may be improving our health. The sound of your cat's purr can calm your nerves and lower your blood pressure. Go ahead and snuggle up! There's a ton of research that says your beloved kitty is good for your heart in more ways than one. Practice your best humble brag because a 2014 study found that those who identify as cat lovers are more introverted, yes, but also more open-minded and sensitive than dog lovers. Cat lovers also scored higher in intelligence than a canine's companions. Feeling anxious? You might want to pencil in an extended petting session tonight. 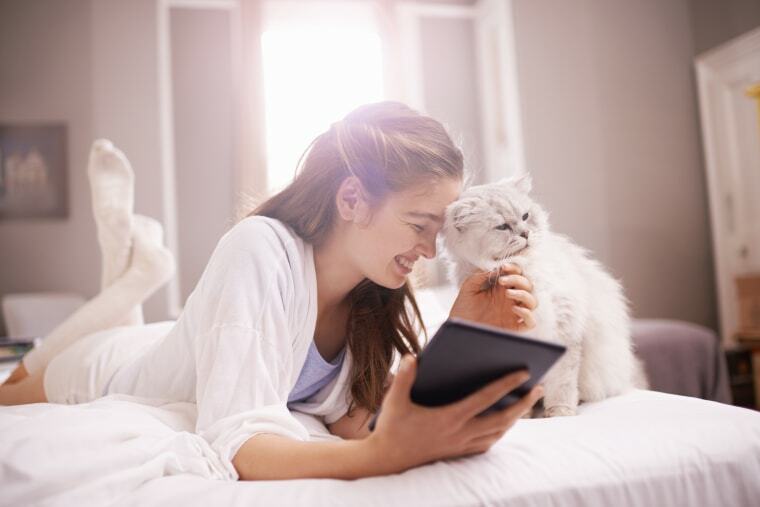 The act of petting your cat releases oxytocin, the bonding hormone or "cuddle chemical," which can make you feel less stressed, says Melanie Greenberg, Ph.D., licensed clinical psychologist and author of The Stress-Proof Brain. In fact, in a study published in the Journal of Vascular and Interventional Neurology, researchers noticed a link between cat ownership and a decreased risk of dying from heart attack or stroke. Even the sound of your cat's purr can calm your nerves and lower your blood pressure. One of the best things a cat can provide is simple: companionship. “People are a little more disconnected these days,” Greenberg says. “And research shows that loneliness is a big factor for all kinds of diseases.” For example, one recent study linked loneliness to an increased risk of Alzheimer’s disease. According to a 2013 Veterinary Medical Association survey, pet ownership among single people is increasing. "It's interesting to see that more and more single people are discovering the comfort and satisfaction that owning a pet can offer. Pets are powerful, positive influences on our lives, offering unique emotional, psychological and physical health benefits to their owners," says Dr. Douglas Aspros, former president of the AVMA, said in a statement. According to a study published in the journal Clinical & Experimental Allergy, teens who were exposed to cats during their first year of life were less likely to develop an allergy to fur babies as a result. “The theory is that by giving the immune system something natural to work on, it develops in a healthy, normal manner and isn’t always overreacting to non-dangerous stimuli,” says Haworth. It's not all about mental or physical health — cats are better for your finances, too. According to the ASPCA, owning a furry feline, instead of a pup can save you about $300 to $800 a year. But you knew this, right? Most cat ladies don't need researchers to back up all of those big health benefits. According to 2015 market survey of cat owners by the pet food industry, 40 percent of women (compared with 25 percent of men) strongly agree that their cats are good for their physical health. And 52 percent of women (compared with 28 percent of men) strongly agree that their cats are good for their mental health, too. So, go ahead and wave that cat lady banner proudly — it's healthy!